I’ve been enjoying sharing some of my bible study methods in this blog series! Today I want to share some ways I dive deeper into God’s Word, and interact with it so I can better understand and apply it to my life. It can be so discouraging to sit down with your bible, read it, and walk away feeling unmoved and unchanged. Sometimes all I have to do is read it and I hear God loud and clear. Other times, I have to dive below the surface, looking deeper to hear His voice. The bible was originally recorded in the native language of the people who revorded it; Hebrew, Aramaic, and Greek. If you want to dive deeper into bible study, then studying these languages is a great place to start. You don’t have to learn the language, you can look into the word meanings and synonyms of the verse you are studying and gain a better insight in just a few minutes. Let me show you how! Pick a verse of scripture you would like to dive deeper into. For this post, I’ll be using John 15:8). Then go to the Blue Letter Bible website. Type in the verse and hit the green search button. Here’s where it can get tricky. Click on the combo of a lower case letter and numbers under the “Strong’s” column of the word you would like to dig deeper into. Now, you have found the REALLY GOOD STUFF! 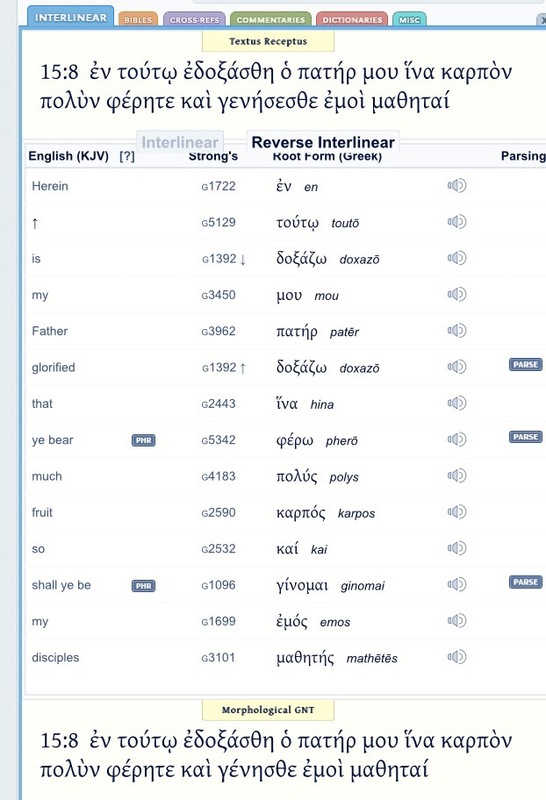 This is where you get to see the Greek (in this case because it’s New Testament) word, listen to it pronounced if you would like, see it’s part of speech, other words in English used in the bible that came from this word, synonyms of this word, its definition, and every verse of the bible this root word shows up in. This is the deep. You could study the word “glorified” through this one page for hours and have your socks knocked off by how glorious our God is. I really cannot downplay how much I love studying the Word in this way. I have been using it for years. It is the resource I use to write bible studies. But it is not just for writing bible studies. I pick words that are intriguing to me out of the verse. Then, I write down the words that are listed under the “Strong’s Definition” to expand on the concept of this word, and help me really wrap my mind around what the Lord was trying to teach us when he included this in scripture. For example, in this verse, the word “glorified” could also be translated “magnify.” So I took away that I want to show how God is working in big ways even in small things, like a magnifying glass would magnify something. Just by interchanging those two words, I was able to take that illustration with me and think on it all day, asking God to be magnified through little ol’ me. 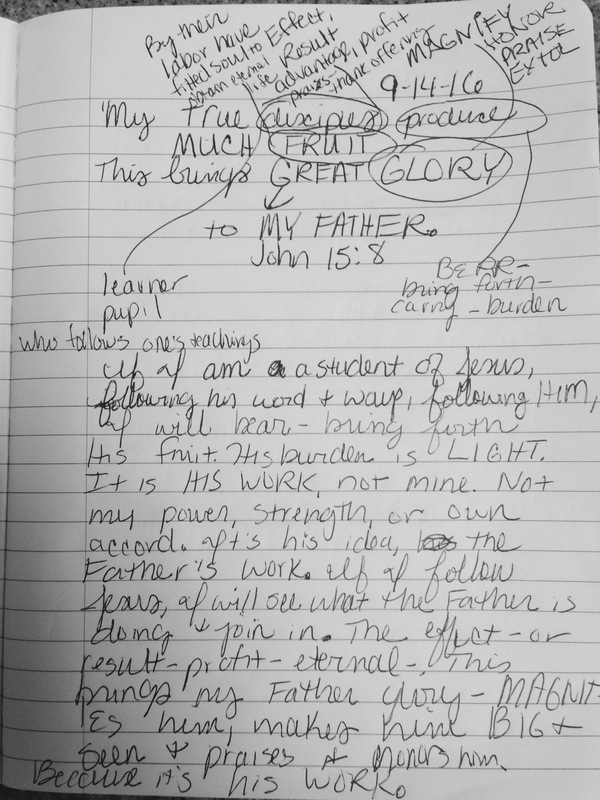 The words I studied next were: disciples, produce, and fruit. After I finish expanding on the most intriguing words in the verse, I use those words to paraphrase the verse, and I turn it into a prayer. I really just ask God do whatever the verse at hand says. I hope this post has inspired you to dive deeper into the Word on your own! I just cannot relay enough how much I love this website! I have a humongous concordance sitting on the shelf that does the same thing, but having it at your fingertips to click is so much more convenient! Have you ever used this site before? What are your favorite websites to dive deeper into God’s Word? I want to hear about it! Comment below! I haven’t heard of this method, thanks for sharing! I have been wanting to dig deeper during my Bible study. I am doing a study called You Are Forgiven now, using the SOAP method. I am really enjoying it but could always use another method to see things in new ways. I love the SOAP method Terryn! I’ve used it a lot in the past. That’s a great group of ladies who came up with it at Love God Greatly. Thanks for reminding me of that one! I’ve used BibleGateway.com for years, but didn’t know about the Blue Letter Bible–that’s awesome! Thanks for sharing! Found you through Facebook and The Peony Project and am happy to follow and explore your blog!